The course is one of the most picturesque in Perthshire with each hole affording not only a new and interesting challenge for the golfer, but also ever changing views of the glorious surrounding countryside. 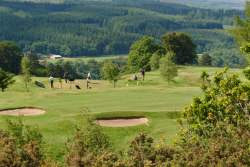 You are guaranteed a friendly welcome, warm hospitality and an enjoyable round of golf at Dunkeld and Birnam. Catering, bar facilities, buggies, trolley and club hire available.